Process Street’s Conditional Logic is a powerful feature that allows you to create truly dynamic checklists with if/then logic that adapt to your teams changing needs. Note: Conditional Logic is a Business Pro feature only. 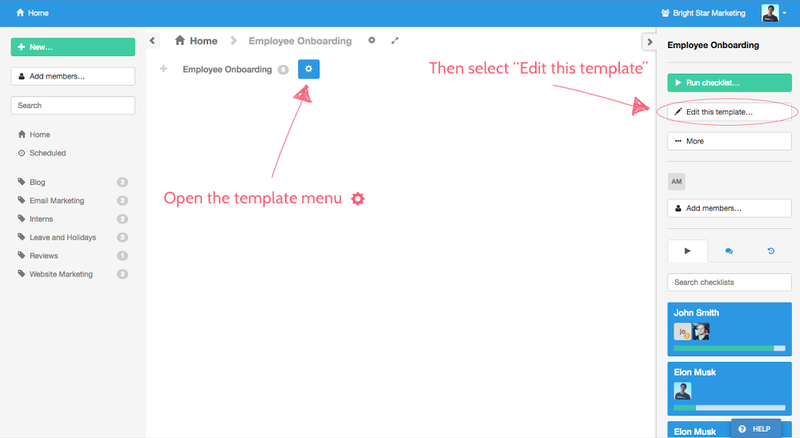 To add Conditional Logic to your template, first select the template you wish to edit. At the top of the page, between the ‘Save Changes’ and ‘Discard Changes’ buttons, you will find the ‘Conditional Logic’ button. 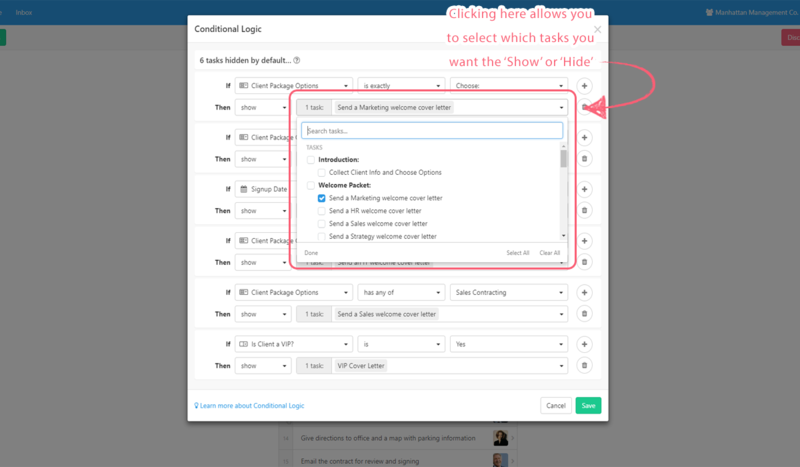 You have the option to hide certain tasks and headers by default, which is a handy way to ensure that tasks do not appear until the proper criteria have been met. Click within the field provided to be presented with a list of all your tasks and headers from which to choose from. Add your first rule by clicking on ‘New Rule’, or if you already have some rules created, add a new one by clicking on the ‘+’ sign on an existing rule. The first drop-down after ‘If’ presents you with a list of all of the form fields from your template that can be used for creating Conditional Logic rules. 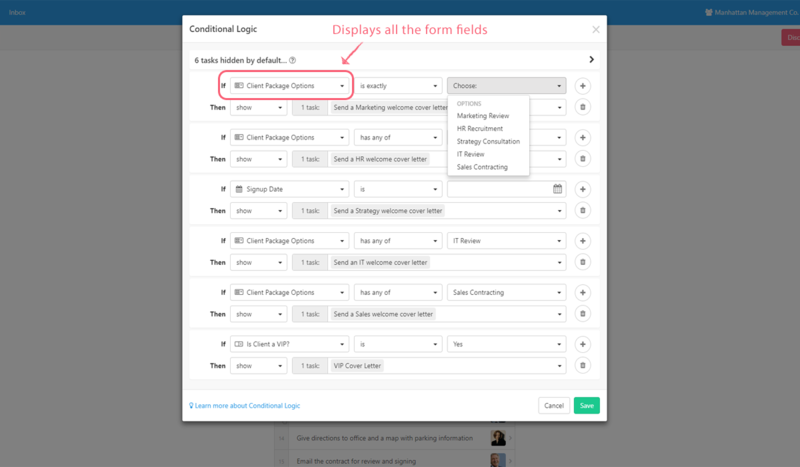 The icon to the left of the field name indicates the type of form field that you are working with. 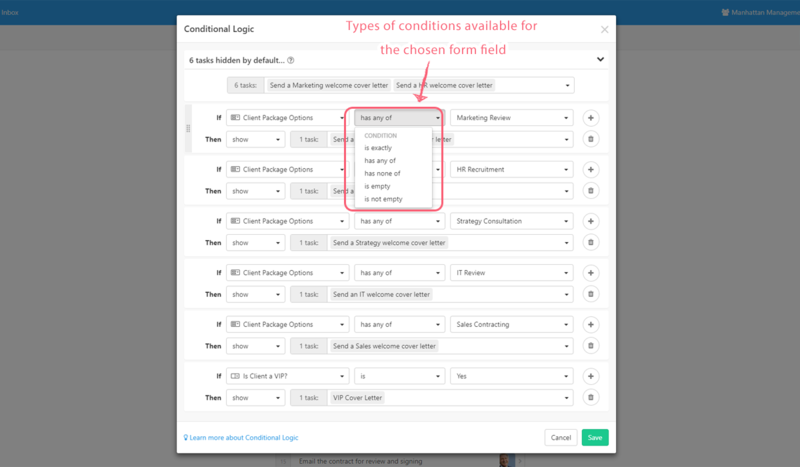 The next dropdown lists the different types of conditions available for the chosen form field. Depending on the type of form field selected, the ‘Options’ field may look a bit different. For the text accepting fields, any value can be submitted into the field provided. 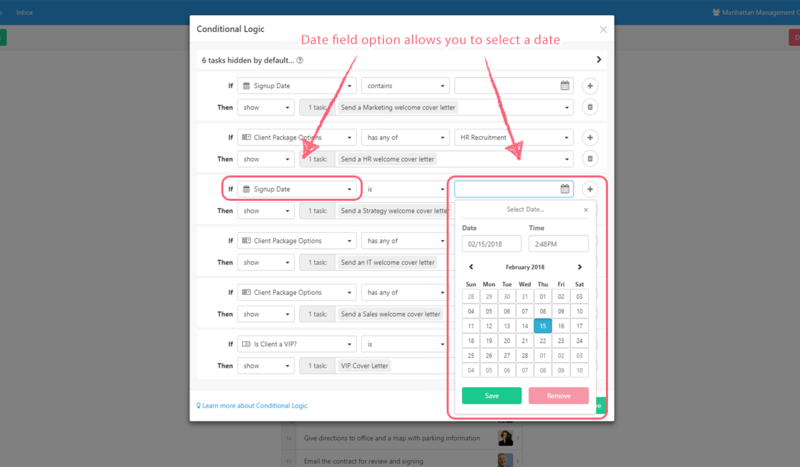 For the Date Field, only dates may be submitted using the provided datepicker. The Dropdown and Multi Choice fields will provide you with the potential ‘Options’ available to choose from automatically pulled from the actual form field options in your template. You’ll need to use the ‘Contains’ condition for Multi Choice fields, and the ‘Is’ condition for Dropdowns. Now, for the actionable part of Conditional Logic, this is where we decide what’s going to happen when our set criteria are or are not met. By using the provided drop-down to the right of ‘Then’ you can elect to show or hide whichever tasks and headers that you’d like. 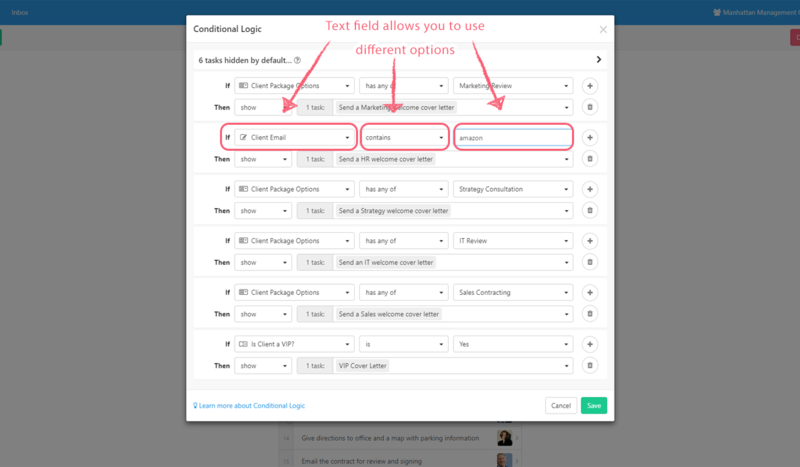 As you did before when hiding tasks by default, click inside the provided field to be presented with a list of all of your available tasks and headers. Click the ‘X’ on the right side of the task or header to remove it after it was originally added. Drag Rules up and down to change the order that your logic will follow. Rules at the top of the list are given precedence over rules below. Add new rules by clicking the ‘+’ button, and remove Rules by clicking the trash can icon. Once you’re done adding and editing rules, click ‘Save’ to keep them. Then, click on ‘Save Changes’ to push your template edits live. Run a new checklist by clicking on ‘Run Checklist’ from the top of the template menu of the template you just edited. You’ll immediately notice that any hidden tasks are now gone! Next, begin to fill out your checklist and you’ll see the right tasks come into play as your form field responses fit into the logic that you created. You can make your templates as simple or complex as you like using Conditional Logic! For more information about editing your templates, please visit our help article on the subject. For more information about our Business Pro and Enterprise plans, please visit our pricing page or reach out to us directly at [email protected].